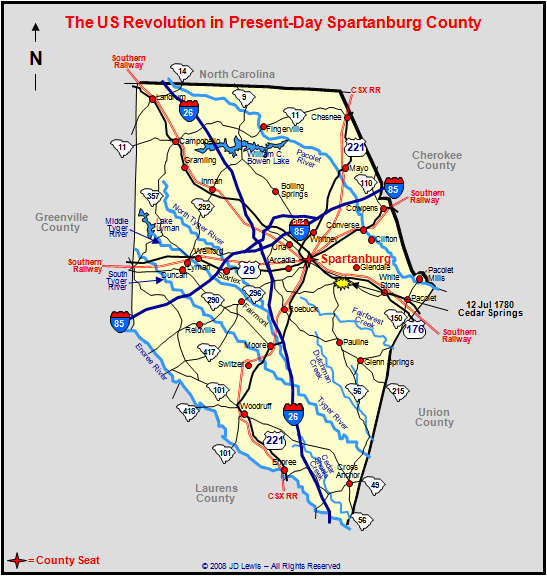 On July 12, Col. John Thomas, Jr was commanding the 1st Spartan Regiment of the South Carolina Patriot Militia. He was warned by his mother that the Loyalists planned to attack his camp. When the attack began at Cedar Springs, the Loyalists ran into a prepared ambush and were beaten back by the Patriot Militia. The Loyalists quickly retreated back to friendly territory after losing several killed. Thomas's mother, Jane, was at Ninety-Six visiting her other son and her husband, both of whom were imprisoned there. While there, she overheard some of the Loyalist womenfolk talking of Major Patrick Ferguson's plans for his subordinates to attack her son's camp at Cedar Springs. She rode sixty miles on the night of July 11th to tell her son, John Thomas, Jr., that there would be an attack on his position soon. Col. Thomas left his campfires burning the next night and moved his men to the rear of the camp. When the Loyalists arrived they found the fires still burning, and they immediately charged into the camp. The Spartans fired a concentrated volley into their ranks, killing several, and scattering the rest - who fled to Gowen's Fort.